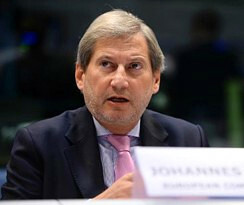 TBILISI, DFWatch–On 14 July, the EU commissioner for enlargement Johannes Hahn will visit Georgia. Mr Hahn will hold meetings with Georgian officials, including Prime Minister Giorgi Kvirikashvili, President Giorgi Margvelashvili, minister of foreign affairs Giorgi Janelidze, and minister for Euro-Atlantic integration, Davit Bakradze. He will also deliver a speech during the annual conference ‘European Way 2016’ in Batumi. Hahn, the commissioner for European neighbourhood policy and accession negotiations, expressed support for Schengen visa waiver for Georgia in June, saying that all formal requirements had been met and that Georgia deserved a quick decision from EU authorities about the visa liberalisation. In May, Hahn said he hoped that Georgians, Ukrainians, and Kosovars would be able to travel without visas to the EU in 2016 ‘because they had done their work’.